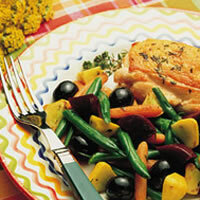 This medley of sautéed veggies is a delicious and healthy side dish to any main course. Heat oil in a large sauté pan over medium. Add carrots and cook for 4-5 minutes, stirring occasionally until lightly browned. Add squash and continue to cook for 3-4 minutes, until tender. Stir in green beans, olives, thyme, garlic and salt and cook for 2-3 minutes until heated through. Toss with butter and sprinkle with beets.